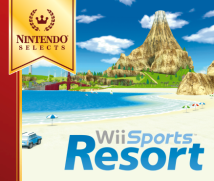 I wanted to ask why you decided to include table tennis in Wii Sports Resort rather than tennis. As far as possible, we wanted to avoid including sports that had already featured in the previous title. I think tennis in particular left a very strong impression on players, so perhaps you were especially keen to avoid including it again. I think that’s true. 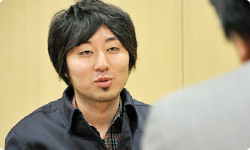 We want the original game to always continue to be played, so we concluded that it would be better to have different sports. Also, I personally wanted to give the cut shots and drives a bit of a harder edge. So that’s why you decided that table tennis would be more suited for inclusion in the new title. Yes, I think that’s probably right. Hmmm… I wonder. What do you think, Sato-san? The superb responsiveness of Wii MotionPlus makes it very well-suited to table tennis. Tennis rallies are slow in comparison and had allowed us to make adjustments to overcome any delay in the response. So whereas tennis has relatively sedate rallies, table tennis has extremely energetic, rapid-fire rallies – bang, bang, bang! Concerning the controls for cut shots and drive shots, these were also possible when playing tennis on Wii Sports. They were, weren't they? Whereas existing tennis games had basically used buttons to select the shot type, it became possible to choose to hit drive shots or lobs using just the arc of your swing. simply twisting the paddle a little will enable them to cut the ball or hit drives . This makes it easier for beginners, while also allowing more expert players to really show off their skills. We also thought that perhaps table tennis is a sport that more people are familiar with when compared to tennis. If you go to an onsen, you're always going to play table tennis. I think there will be a lot of people who have actually played the sport and who therefore understand how to put spin on the ball. In that sense, we thought that this sport would be one where people would be able to grasp the concept very easily. I actually did feel a lingering attachment to tennis on occasion, but on the whole I’m glad that we went with table tennis in the end. Well, table tennis is still a kind of tennis! We've already spoken about how you got that “resort feel” by locating table tennis beside the pool. What other resort-style sports did you go for? island flyover is one example. The original idea was to use a hang-glider, but I was firmly opposed to this. Why were you opposed to it? A hang-glider sounds like it has that “resort feel”. I thought that the new control system for the plane would prove a much better match with Wii MotionPlus than a hang-glider. Tell me more about that new control system you mentioned. I think everyone has held a model plane in one hand and made it fly while making an engine noise. Everyone did that when they were a kid. That's why we came up with the idea of replacing the toy plane with a Wii Remote to let you enjoy playing in the same way. One suggestion was that the plane should be controlled with a joystick, and we did consider having this style of control. The idea would be that you held Wii MotionPlus as a pilot would hold a joystick, but doing that actually made the controls quite fiddly. Even given the fact that you are able to fly freely in a three-dimensional space, I think there would be a lot of players who would find it difficult to pilot the plane using the joystick-style. But if you are actually holding the plane in your hand and its movements are synchronised with the plane on the screen, you feel more strongly that it's you who is flying it. You can then manoeuvre through the three-dimensional space in a way which I hope is more intuitive and fun. It also dispenses with the need to use buttons, doesn’t it? That’s correct. You play by simply holding the Wii Remote between your index finger and thumb. What's more, by doing a flyover, you'll get to know Wuhu Island very well. Being able to pilot a plane and do a flyover is a goal that Miyamoto-san has been working towards for some twenty years, isn’t it? A goal he’s been working towards for twenty years? Would you care to explain that in more detail? (laughs) I can remember that wakeboarding has been a goal of yours for the last ten years and doing an aerial flyover has been a goal for twenty years. You’re right. Being able to somehow manoeuvre freely through the skies has been something I’ve been pondering ever since the time of Pilotwings9. I think I’m right in saying that Pilotwings was released in 1990. That’s right. It came out in 1990. So it’s been almost twenty years. I was actually working on a water-skiing game over ten years ago. As it's a sport where you're pulled behind a boat, we needed to design the boat as well as the waves. It was a bit of a struggle for a console at that time to handle these kinds of things, so I gave up on the water-skiing idea and decided to work on a jet ski game, which resulted in Wave Race 6410. 9 Pilotwings was a flight simulation game for the Super NES console. It was released in Japan in December 1990. 10 Wave Race 64 was a jet ski racing game for the Nintendo 64 console. It was released in Japan in September 1996. But even though over ten years have passed since then, you never completely gave up on the idea of a water-skiing game. It just seemed like it would be a lot of fun. It seems that wakeboarding has become more fashionable than water-skiing recently though. You can see lots of people with boats wakeboarding on Lake Biwa. That’s why I can see young people really getting into it. They’ll also be able to savour that “resort feel”.